Our curriculum is designed to anticipate and exceed industry needs. 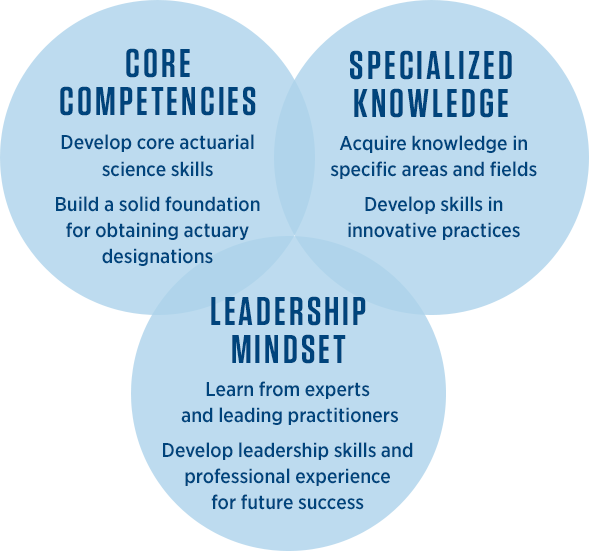 It equips students with knowledge and skills to excel in the evolving workplace, and fosters leaders in the rapidly expanding actuarial profession. In addition to offering a solid actuarial foundation, the program's emphasis on leading-edge subjects, including predictive modeling, machine learning, risk management, and financial markets, allows students to build essential skills in innovative practices. An academic committee staffed by faculty from Columbia’s Department of Statistics, Department of Industrial Engineering and Operations Research (IEOR), and elsewhere at the University, steers the curriculum quality, admissions criteria, course approvals, and faculty hiring. Students have access to many courses offered across the University, including through the Departments of Statistics, Math, and Economics, and the M.S. in Enterprise Risk Management and Business Certification programs. All core courses are taught by actuaries and analytical professionals who have a Ph.D. and 15+ (most of them 20+) years of industry experience. Most also have SOA/CAS (Society of Actuaries/Casualty Actuarial Society) designations. Eduniversal ranks the program third among insurance, risk, and actuarial science master’s programs worldwide. The program’s professional and career development features and courses have been tailored to build leadership, presentation, and communication skills. Students and graduates join an elite global network of 650+ Ivy League alumni who hold pivotal roles, and industry thought-leaders who are aligned with the program. This list represents a sample of the 160+ organizations that are part of the program’s global network. Many of these organizations provide employment opportunities to our students and alumni, participate in the Proseminar lecture and networking series, act as mentors for the Integrated Project elective, and take part in annual events including the Columbia Actuarial Science Career Day, Columbia Actuarial Science Program Career Fair, and the Actuarial Society of Greater New York’s Actuarial Career Fair. With a strong background in a quantitative field, such as mathematics (including teachers and tutors), statistics, actuarial science, physics, economics, computer science, accounting, or finance. With strong quantitative skills who are looking to transition into the actuarial field. Interested in starting a career, career advancement, and exam preparation. All applicants require knowledge of elementary economics, linear algebra, and multivariate calculus. Jacob Snow (’16SPS, Actuarial Science) works as an actuarial analyst at New Jersey’s largest health network, Hackensack Meridian Health. Eric Stewart (’15SPS, Actuarial Science) enhanced his analytical, leadership, and interpersonal skills through the M.S. in Actuarial science program. Hanbing He (’14SPS, Actuarial Science) graduated from Central University of Finance and Economics in Beijing, China before earning his Actuarial Science degree from Columbia. In as few as two semesters, build and expand your knowledge of actuarial science and provide a foundation to successfully enter the field.